, a Scottish historian, was born at Edinburgh, in 1742. 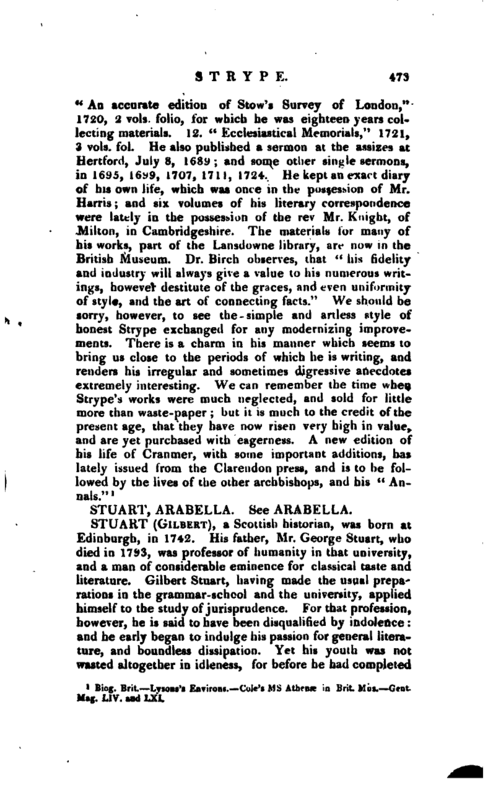 His father, Mr. George Stuart, who died in 17>3, was professor of humanity in that university, and a man of considerable eminence for classical taste and literature. Gilbert Stuart, having made the usual prepa‘ rations in the grammar-school and the university, applied himself to the study of jurisprudence. For thr-.t profession, however, he is said to have been disqualified by indolence: and he early began to indulge his passion for general literature, and boundless dissipation. Yt t his youth was not wasted altogether in idleness, for before he had completed | his twenty-second year, he published “An Historical Dissertation concerning the Antiquity of the British Constitution,” which had so much merit as to obtain for him the degree of doctor of laws, from the university of Edinburgh. After an interval of some years, in which he could not have neglected his studies, he produced, 2. “A View of Society in Europe, in its progress from rudeness to refinement; or inquiries concerning the history of laws, government, and manners.” This is a valuable work, and proves that he had meditated with much attention on the most important monuments of the middle ages. 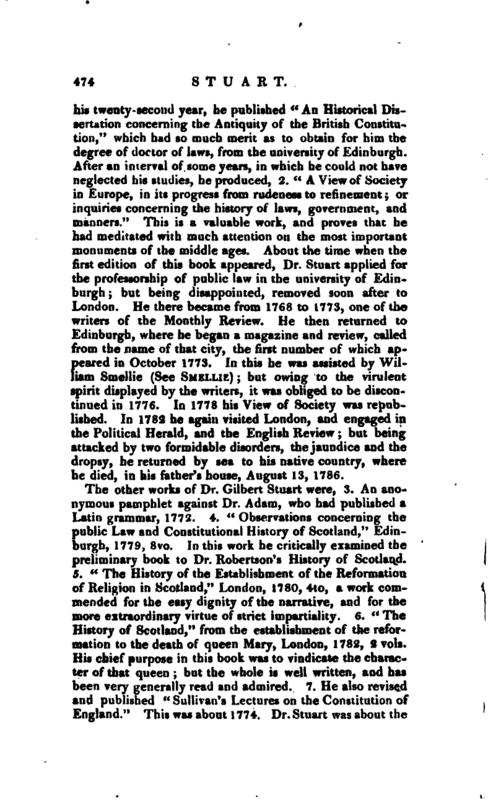 About the time when the first edition of this book appeared, Dr. Stuart applied for the professorship of public law in the university of Edinburgh; but being disappointed, removed soon after to London. He there became from 1768 to 1773, one of the writers of the Monthly Review. He then returned to Edinburgh, where he began a magazine and review, called from the name of that city, the first number of which appeared in October 1773. In this he was assisted by William Smellie (See Smellie); but owing to the virulent spirit displayed by the writers, it was obliged to be discontinued in 1776. In 1778 his View of Society’ was republished. In 1782 he again visited London, and engaged in the Political Herald, and the English Review; but being attacked by two formidable disorders, the jaundice and the dropsy, he returned by sea to his native country, where he died, in his father’s house, August 13, 1786. 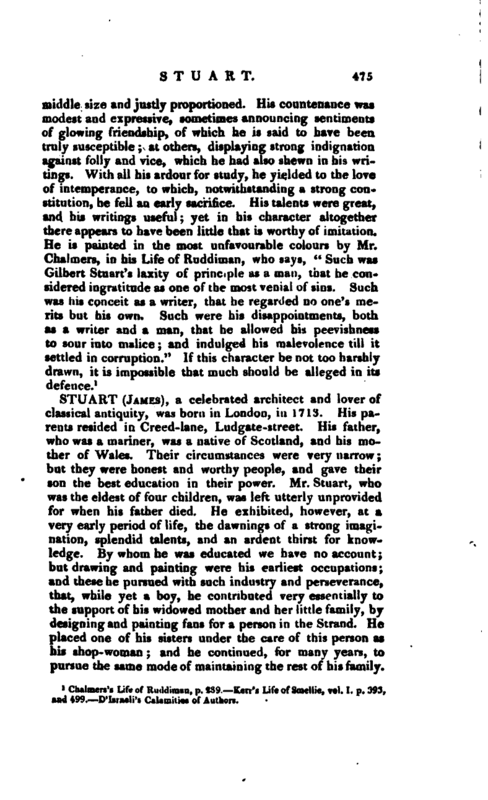 Chalmers’s Life of Ruddiman, p. 239 Kerr‘a Life of Smellie, vol. I. p. 393, and 4S9. D’Israeli’s Calamities of Authors.